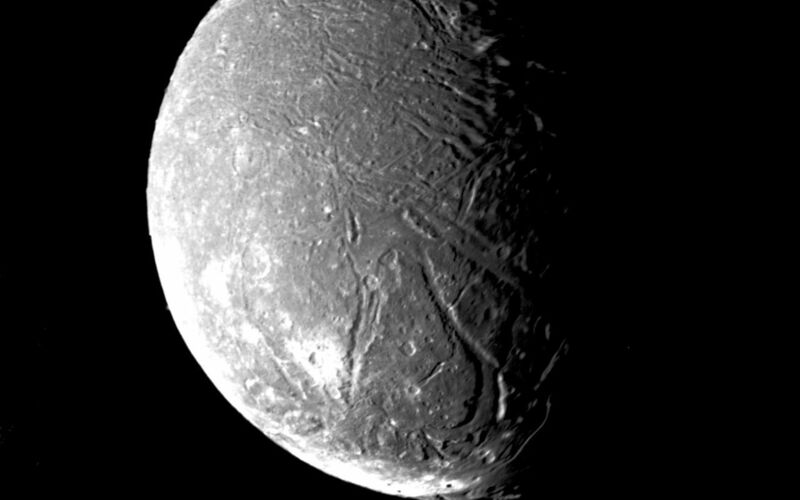 This mosaic of the four highest-resolution images of Ariel represents the most detailed Voyager 2 picture of this satellite of Uranus. The images were taken through the clear filter of Voyager's narrow-angle camera on Jan. 24, 1986, at a distance of about 130,000 kilometers (80,000 miles). Ariel is about 1,200 km (750 mi) in diameter; the resolution here is 2.4 km (1.5 mi). 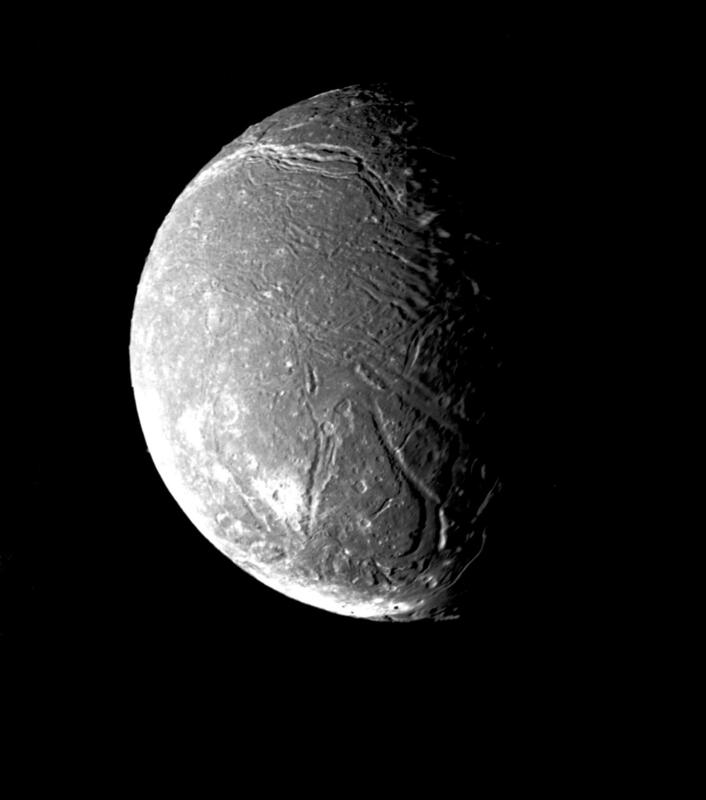 Much of Ariel's surface is densely pitted with craters 5 to 10 km (3 to 6 mi) across. These craters are close to the threshold of detection in this picture. Numerous valleys and fault scarps crisscross the highly pitted terrain. 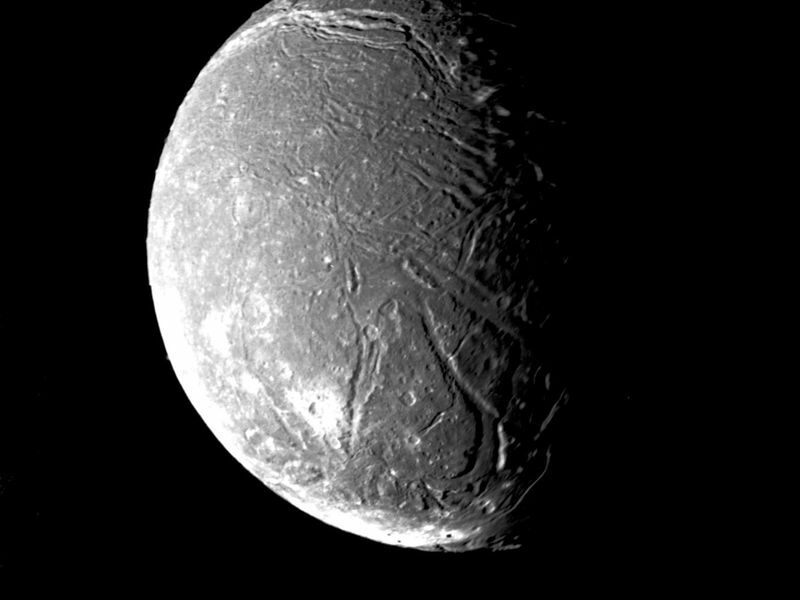 Voyager scientists believe the valleys have formed over down-dropped fault blocks (graben); apparently, extensive faulting has occurred as a result of expansion and stretching of Ariel's crust. The largest fault valleys, near the terminator at right, as well as a smooth region near the center of this image, have been partly filled with deposits that are younger and less heavily cratered than the pitted terrain. Narrow, somewhat sinuous scarps and valleys have been formed, in turn, in these young deposits. It is not yet clear whether these sinuous features have been formed by faulting or by the flow of fluids.